Imagine not being able to afford to buy any type of motorcycle. Not even the rustiest, crappiest, lowest of the low displacement bike that you wouldn’t even play wee-wee firemen with it if an English rioter had agressively flambéd it. Then imagine living in a country that has a very limited selection of bikes. 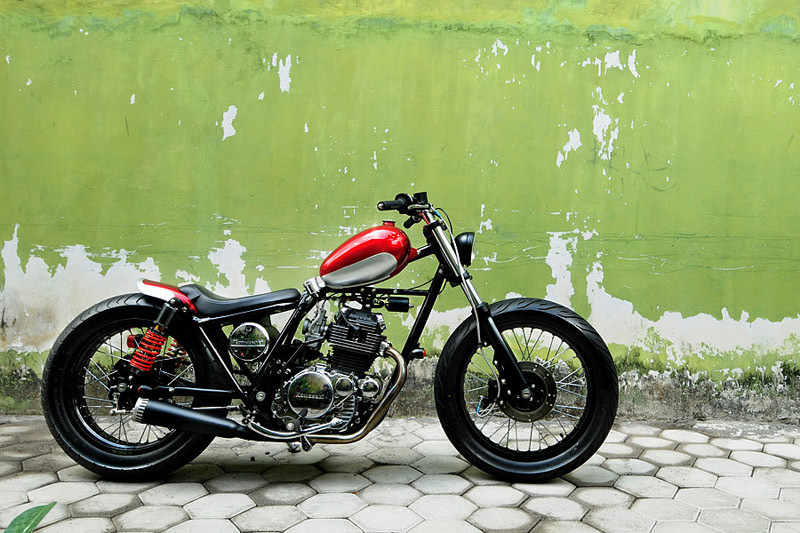 Then imagine (stay with us here) you have a dream to become a great custom bike builder. What do you do? Well, Agus Darizt from Java, Indonesia faced this problem a few years ago. So he worked out the only thing he could afford to customize was small scale model kits. He got so good at handling the super glue and plastic a friend asked Agus whether he would be interested in building a real bike for him. Of course he jumped at the chance and he hasn’t looked back since. “I started from scratch,” he says. “I learnt how to weld, how to use a bench lathe machine and refined my metal shaping techniques, and 5 months later the Preambule Orange CB100 (pictured below) was finished”. Now three years later and Agus is up to his ninth bike, or “attempt number 9” as he humbly calls it.